A young woman amputated from the knee breastfed a 40-day-old infant who had lost his entire family in the bombings. With support from Russia, the Security Council adopted a resolution on the ceasefire to allow for humanitarian aid deliveries and medical evacuations, but the measure did not specify when the truce would go into the force beyond saying it should be "without delay." After the council vote Saturday, Syrian warplanes backed by Russian air power launched new raids on a town in Eastern Ghouta, the Syrian Observatory for Human Rights said. At least 127 children are among the 519 dead in the bombing campaign that the regime launched last Sunday on the rebel enclave, just outside Damascus, the British-based monitor said. 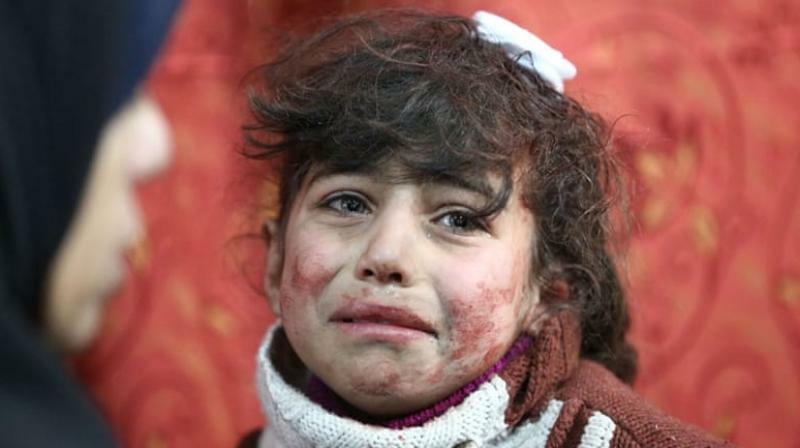 At least 41 civilians were killed in Saturday's strikes, including eight children. Russia has denied taking part in the assault. Quickly following up on the vote, French President Emmanuel Macron and German Chancellor Angela Merkel will speak by phone Sunday with Russian President Vladimir Putin to push for the truce to take hold "in the coming days," the Elysee palace said in a statement. To this end, France's Foreign Minister Jean-Yves Le Drian will also go to Moscow on Tuesday. The UN vote was initially expected to be held Thursday but was repeatedly delayed as diplomats were locked in tough negotiations to avoid a veto from Russia, which is militarily supporting President Bashar Al-Assad. "As they dragged out the negotiations, the bombs from Assad's fighter jets continued to fall. In the three days, it took us to adopt this resolution, how many mothers lost their kids to the bombing and the shelling?" Russian Ambassador Vassily Nebenzia rejected accusations of foot-dragging, saying that negotiations were needed to arrive at a demand for a ceasefire that was "feasible." "What is necessary is for the demands of the Security Council to be underpinned by concrete on-the-ground agreements," he said. UN Secretary-General Antonio Guterres, who has described Eastern Ghouta as "hell on Earth," said the ceasefire must be "immediately" implemented. To win Russia's approval, language specifying that the ceasefire would start 72 hours after the adoption was scrapped, replaced by "without delay," and the term "immediate" was dropped in reference to aid deliveries and evacuations. In another concession to Moscow, the ceasefire will not apply to operations against the Islamic State group or Al-Qaeda, along with "individuals, groups, undertakings and entities" associated with the terror groups. That would allow the Syrian government offensive to continue against Al-Qaeda-linked jihadists in Idlib, the last province in Syria outside the control of Damascus. French Ambassador Francois Delattre said it was now important to ensure the ceasefire turns into reality on the ground, vowing to be "extremely vigilant... in the hours to come and the days to come." "Nothing would be worse than seeing this resolution remain a dead letter," he said. Russia has vetoed 11 draft resolutions throughout the Syrian conflict to block action that targeted its ally. In November, it used its veto to end a UN-led investigation of chemical weapons attacks in Syria. In Eastern Ghouta, news of the UN vote on the ceasefire was greeted with a shrug. "I don't think this decision will be implemented. It will be respected neither by the regime nor Russia," said Abu Mazen, a resident of Douma, Eastern Ghouta's main town. "We can't trust Russia or the regime. We are used to their betrayals," he added. Control of Eastern Ghouta is shared between two main Islamist factions, while Syria's former Al-Qaeda affiliate is also present. Russia has been pressing for a negotiated withdrawal of rebel fighters and their families like the one that saw the government retake full control of Syria's second city Aleppo in December 2016. World leaders have expressed outrage at the plight of civilians in Eastern Ghouta. The enclave is surrounded by government-controlled territory, and its 400,000 residents are unwilling or unable to flee the deadly siege. In one of the many unfolding dramas at a field hospital in Douma, a young woman amputated from the knee breastfed a 40-day-old infant who had lost his entire family in the bombings. Food supplies have been running dry, with bread no longer available on local markets. The cornered rebels in Eastern Ghouta have been firing back into Damascus, where six civilians were wounded Saturday, state media said. Around 20 people have been killed in eastern districts of the capital since last Sunday, according to state media. More than 340,000 people have been killed and millions driven from the homes in the war, which in March enters its eighth year with no diplomatic solution in sight.